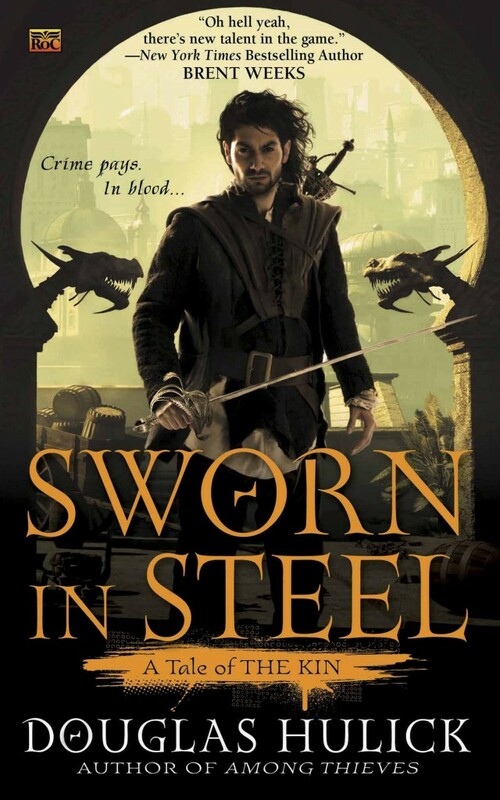 A strong second book in the series Tales of the Kin, Sworn in Steel takes place shortly after the first book, Among Thieves. This book is on a lot of fantasy readers most anticipated 2014 lists as the first book was highly acclaimed by many, this writer included, and the ending of Among Thieves set up excellently for this book. We find our main character Drothe in a new area in this unique secondary world the author has created, and with that we meet many interesting underworld characters there while exploring this vast new area. I felt I got to know Drothe even more here, as well as Bronze Degan. We learn a great deal more about the Degans and their history, which was complex and compelling. This is really more of a story about that mysterious order than anything else although there were several layers to the plot. The nuances of the politics in this world are very detailed and put together with great precision. The narration is from the main characters POV and I learned I strongly prefer this style to the now very popular A Song of Ice and Fire's multiple POV's. I have read so many books in the past few years (and a LOT recently) with the multiple POV style that this was an excellent change of pace for me. The narration and dialogue are very well written, clever and funny. This is a book with gritty characters who are bad guys. Thieves, assassins, crime bosses, murderers all abound. As in the first book, the details about the underworld and all its intricacies are expertly imagined. Reading this, you get the feeling that this is how the underworld actually works and it is easy to find yourself lost in all its violence and intrigue. Characters act in unexpected ways and the plot twisted and turned which kept me guessing what would happen next. As far as books about thieves and underworlds go, this is clearly top of the line. There are a lot of books about thieves. The first series I recommend to people interested thieves is Tales of the Kin. I would recommend to readers considering this book, to read the first in the series, Among Thieves. I think the first book did a lot of setting up for this book and without having read that one, you will not get as much from this one. However if you read the first book, you will certainly enjoy this one. And the good news is that based on the ending, there will be another Tales of the Kin book and I can't wait! It may be noticed I rated this book a bit lower than the first one. While objectively this is an excellent book, I can say I liked this book but I loved the first one. This one seemed a bit long and a bit drawn out for me. I remember one conversation that went on for many pages, like 20+. While I learned a lot from it, it seemed overly long and a bit complicated. This book is about 100 pages longer than the first and that may appeal to many readers but less is more for me. While there was some great action in this book, I also felt there were a few long stretches where not a lot happened and I was hoping the pace would pick up. Having said that, I can be an impatient reader so I maintain that this is an excellent book which should definitely be picked up by fantasy readers who like a little bit edgier and darker styled fantasy in the style of Scott Lynch, whose books this series is reminiscent of.